The city of Sunny Isles Beach offers several high-end luxury oceanfront apartments which are available for sale. This is a favorite place for the up-scale condo buyers as this gorgeous beach city offers a large variety of options for condo-buyers to choose from and find the best luxury residences. 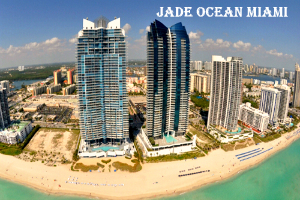 Among the numerous luxury condominiums, Jade Ocean is one of the top condominiums in the Sunny Isles area. This luxury condominium, with its modern, all-glass structure and magnificent in appearance offers top-notch amenities which wins the hearts of the residents and the prospective condo buyers. This condominium incorporates all the luxury residential features that every condo buyer expects to get in a luxury condominium. The location of this condominium is very apt and it is just few minutes away from most Miami’s and Fort Lauderdale attractions. The residents can enjoy the gorgeous city life, as well as the blissful oceanic ambiance by residing in Jade Ocean Sunny Isles. This lofty condo tower is 51-storey high and offers 256 units with extraordinary residential features. The units are spacious and are available in varying sizes and prices. If you want to buy a unit in this lavish condominium, you may contact the various notable real estate companies, which are offering units in this condominium for sale. The awe-inspiring structure of this magnificent condominium is designed by the well-known architect and designer, Carlos Ott. Right from the exterior appearance to the interior design and décor of the building, as well as the units, everywhere, there is a touch of luxury, elegance, and beauty. Jade Ocean, Miami, gives aesthetic pleasure to the visitors and onlookers at the very first sight and residing in this condominium is like living in a blissful, paradisal world of luxury and comfort. The building’s features and amenities are remarkable and provide utmost satisfaction to the residents. The lavish three-storey lobby at the entrance of the building is highly impressive and it also offers amazing views of the great ocean. A private beach club along with cafes and cabanas is there to offer relaxation to the residents. There are beautifully designed infinity-edge pools and a splash deck for the kids. The building also features a well-equipped fitness center, covered parking areas with full-time valet services, 24/7 security and concierge services, elegantly designed conference rooms, etc. Every unit features smart home technology, large and beautiful terraces, floor to ceiling glass windows, large walk-in closets, etc. The kitchens have branded kitchen appliances, granite countertops, etc. ; the bathrooms have marble flooring, luxury bathtubs, designer faucets, etc. All these and many more impressive features and amenities are offered to the residents in Jade Ocean, and they enjoy a satisfying life in this gorgeous condominium.